In 1942, then 23-year-old Fred Korematsu (bottom center) refused to obey the federal government’s order to imprison Japanese-Americans. He was promptly arrested and convicted of defying the government. The ACLU appealed Korematsu’s case all the way to the Supreme Court where judges ruled for his conviction one final time in 1944. By then Korematsu and his family had been interred at the Central Utah War Relocation Center, where his community both praised and criticized him. Many Japanese-Americans complied with the government’s order in hopes it would prove loyalty to their country. 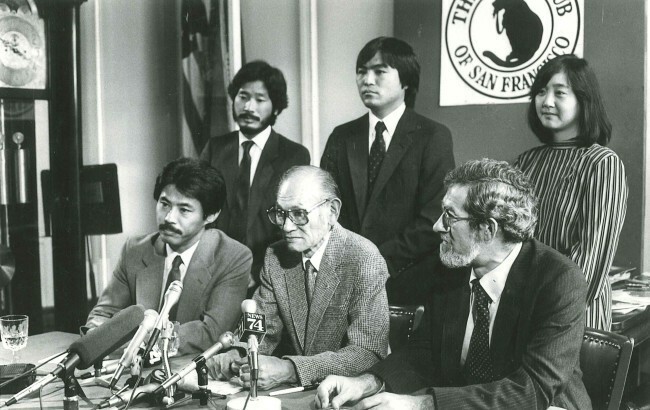 Korematsu’s legal case was reopened in 1983 when researchers discovered government intelligence documents containing evidence hidden from the Supreme Court during his trial. Korematsu’s conviction was overturned. In 1998, President Clinton awarded Korematsu the Presidential Medal of Freedom. “If you have the feeling that something is wrong, don’t be afraid to speak up,” Korematsu said. Today, California celebrates his courage with Fred Korematsu Day on January 30, the first day named for an Asian-American in U.S. history. For more stories, follow Soulbelly.